South Korea’s largest panel maker LG Display said Tuesday the company has been approved by the Chinese government to build a new joint venture and plant for production of organic light-emitting diode display panels in Guangzhou. The Korean OLED panel maker has set up a joint venture with Guangzhou Development District with a capital of 2.6 trillion won, and invested nearly 5 trillion won to construct an 8.5-generatioin OLED manufacturing facility. The new plant will start its operations in the second half of 2019, mainly producing OLED panels for TVs. The monthly production capacity is set at 60,000 panels, and the company plans to ramp up to 90,000 gradually. Combined with the 70,000 panels being produced at its E3 and E4 plants in Paju, Gyeonggi Province, LG Display will be manufacturing a total of 130,000 OLED panels per month, and 10 million units for 55-inch TVs for the whole year. 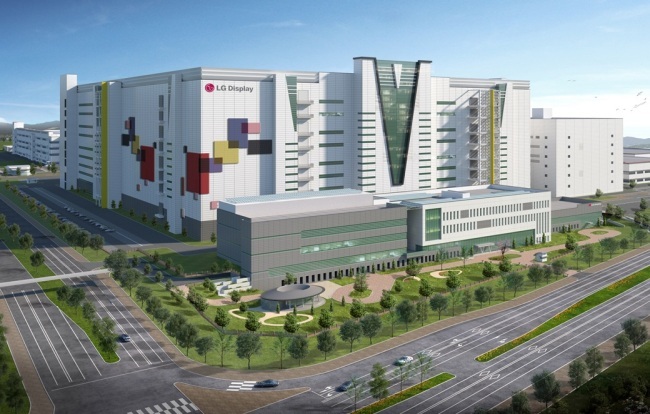 “We welcome the Chinese government’s approval, and we will do our best to complete the OLED factory as early as possible in a bid to provide products at opportune times,” said Han Sang-beom, vice chairman of LG Display. “The company will ultimately convert its business structure to center on the OLED business,” he added. According to IHS Markit, global sales of OLED TVs are estimated to reach 10 million by 2021, up from 4 million in 2019. China is the fastest growing market for OLED TVs showing sales growth rates of over 100 percent. The market researcher forecasts a 120 percent growth in OLED TV sales in China in the third quarter of this year from a year earlier. LG Display sold a total of 1.7 million OLED TVs last year, and expects to sell around 3 million this year. “As demand for large OLED panels is rising, the company expects the first-ever surplus in the large-size OLED business this year,” a company official said.